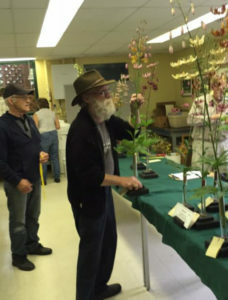 As the planning was underway for this year’s 21st Annual Martagon Show there was a great deal of concern about how many stems would be entered in the Show. The early spring with late frosts seemed to once again pose some challenges for our annual event. March had temperatures that were in the high 20 degree C and then in mid-May the thermometer dropped as low as minus 10. 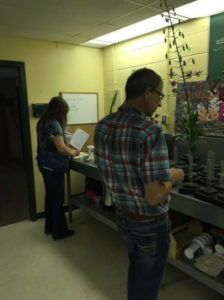 Rural gardeners were plagued with blind stems and damaged inflorescences due to the frost; while many of our urban Martagon growers saw their flowers come and go before the Show. Due to the frost the Martagon bed at the Devonian Botanic Garden, where we partner to host the Show, usually provides a splendid display but this year only had three stems in bloom. On the evening of Friday July 1st as staging began it became apparent that we were going to have a very good Show. For a change, our fellow Martagon enthusiasts from the south were not plagued with the frost we had experienced in the north central part of the province. 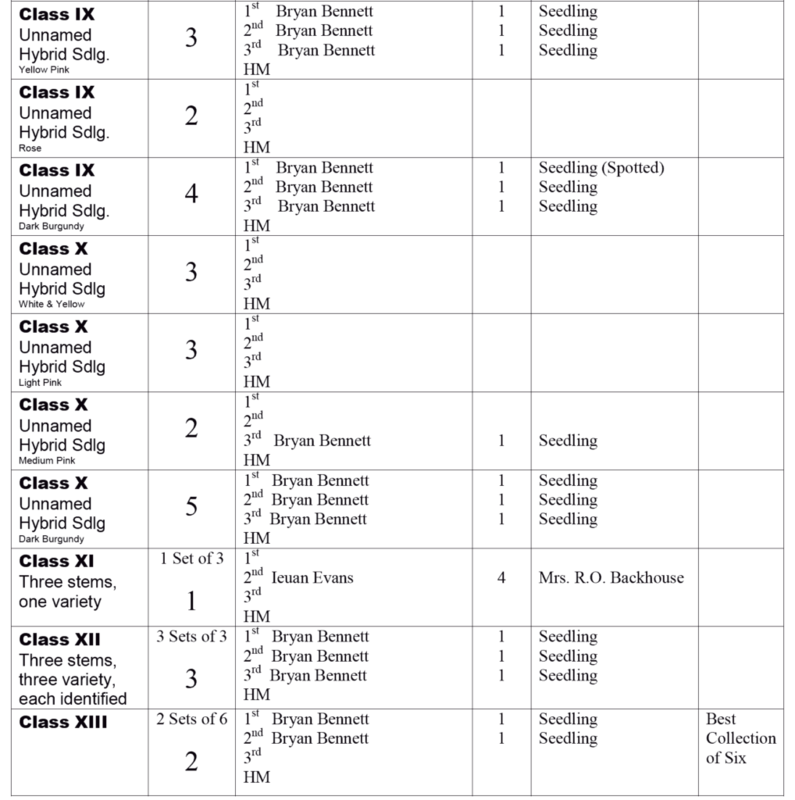 Bryan Bennett had a bumper crop of incredible stems. 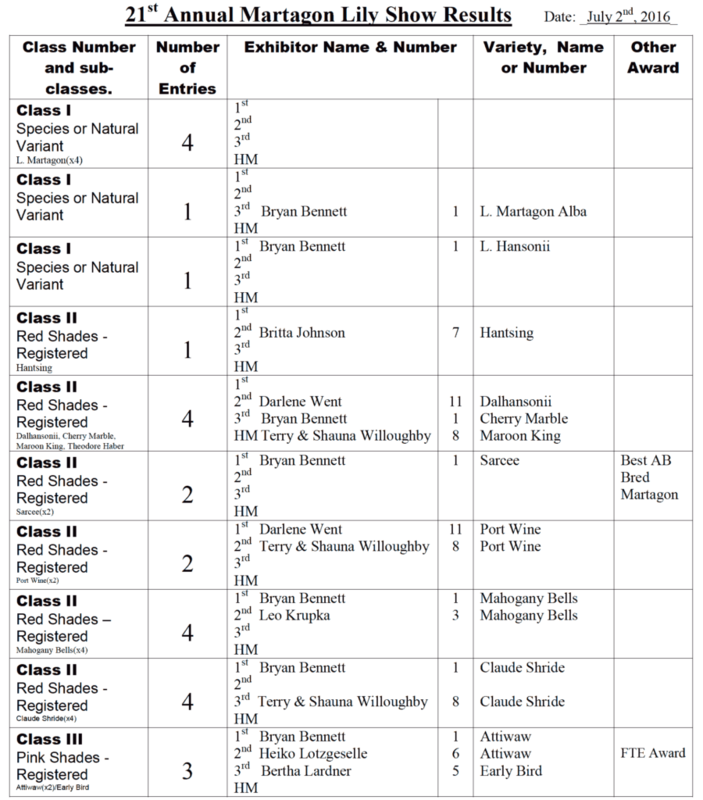 Prior to the judging Saturday morning, 11 other exhibitors rounded out the Show and when all the grooming was done, 125 stems made up a fabulous exhibit of Martagons for the Show. We were very excited to have two first time exhibitors vying for the FTE Award, Heiko Lotzgeselle and Suzanne Stack. They both worked studiously to stage their stems for the competition! As 10:00 am approached on Saturday morning all of the exhibitors focused on the final grooming of their stems. 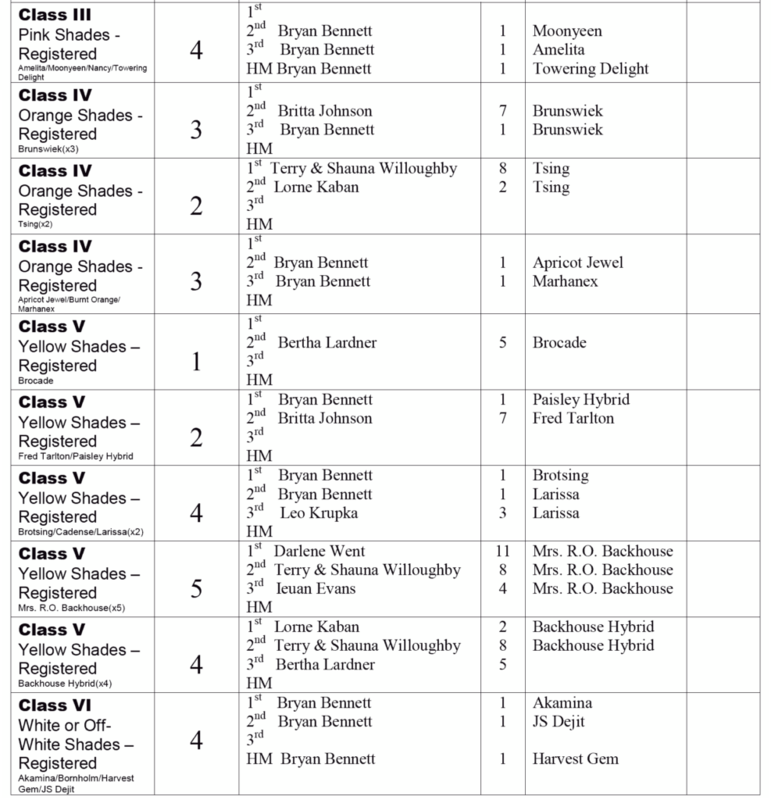 Shauna Willoughby and Leo Krupka then took over classifying the stems into classes and sub-classes. 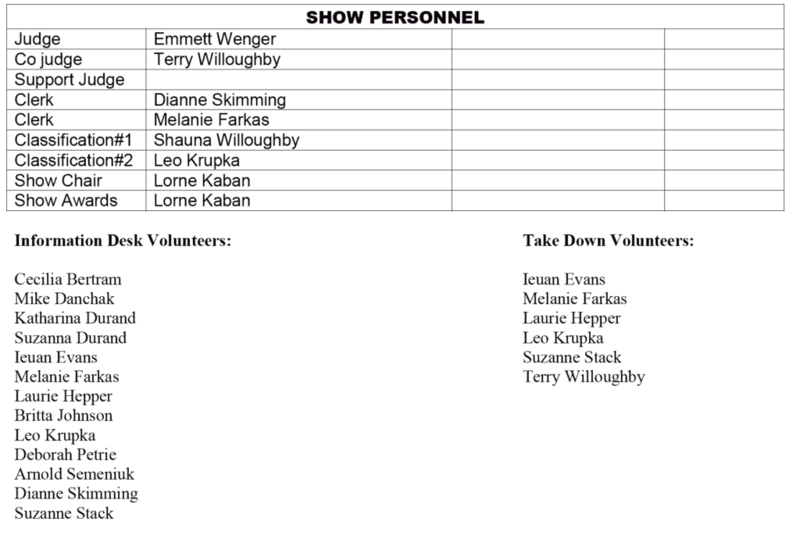 Dianne Skimming and Melanie Farkas, show clerks, provided their support, moving and positioning stems so they were ready for judging. Bryan Bennett carefully staging his collection of six Martagons. Emmett Wenger and Terry Willoughby carefully evaluated each stem with a commitment to awarding ribbons to each and every stem that was worthy of one. When the judging was complete a total of 72 ribbons were awarded: 23 firsts, 25 seconds, 30 thirds and 4 honorable mentions. Terry and Shauna Willoughby’s 2002-8 Seedling with a beautiful inflorescence of 40+ light pink perfectly placed flowers and buds was the winner of the Hybridizer’s Award – Best Stem from Class (VIII) and the Fred Tarlton Award – Best Stem of the Martagon Show. 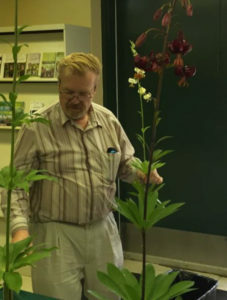 Bryan Bennett’s stem of Sarcee captured the Alberta Regional Lily Society Award – Best Alberta Bred Martagon and his incredible collection of seedlings won the Best Collection of Six Martagons. Heiko Lotzgeselle earned the FTE Award – Special Award for First Time Exhibitors with a well-staged stem of Attiwaw. The Gold Sweepstakes went to Bryan Bennett with 13 first ribbons, Terry and Shauna received Silver for their 6 firsts and Darlene Went got the Bronze with 2 firsts. 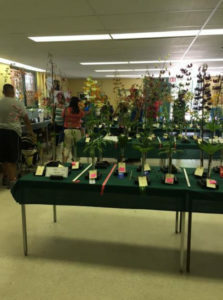 It worth noting that last year Darlene was a first time exhibitor and this year with only three stems entered was able to take the Bronze Sweepstakes. Way to go Darlene! Heiko Lotzgeselle, First Time Exhibitor Award winner, focused on staging his stems. 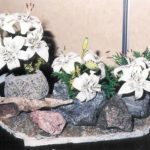 The beautiful weekend weather saw many patrons visit the Devonian Botanic Garden; at least 655 visited the Martagon Show and were impressed by the fabulous display of Martagon lilies. 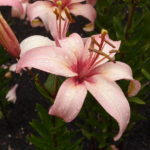 For many of the visitors to the Show, this was their first time seeing these dainty members of Genus Lilium. Some visitors asked if they are related to orchids because of their shape and size. 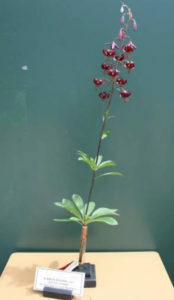 They were thrilled to hear that they are hardy to our Zone 2 and 3 gardens here in Alberta. Others were surprised and impressed to learn that we have many renowned Martagon hybridizers from right here in our province and the local area around the DBG. Whether this is a gardener’s first time seeing the Martagons or they are a seasoned grower, many walked through the Show and jotted down a list of cultivar names that they were eager to add to their garden in the fall. The fall bulb sale schedule was distributed to ensure they could fill their wish lists! Our partnership with the Devonian Botanic Garden continues to be strong and allows us to successfully execute this annual event. The staff does an excellent job of setting up the room and having the stem holders ready for staging. The classroom while sometimes a little warm provides a nice venue for our Show. As the Gardens continue to develop there is a plan to build an Education Pavilion that will provide more space and natural light for the Show. In the meantime, ARLS would like to extend our heartfelt thanks to the DBG for their ongoing support and commitment to the success of the Show and our longstanding partnership. 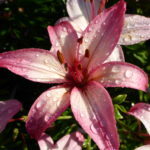 There was a steady stream of visitors to the garden enjoying the fantastic display of Martagon lilies. Finally, this event is made possible by the countless hours of support the incredible team of volunteers provide; hosting the Show, answering questions from the visitors, setting up and taking down. I would like to personally thank Cecilia Bertram, Mike Danchak, Katharina Durand, Suzanna Durand, Ieuan Evans, Melanie Farkas, Laurie Hepper, Britta Johnson, Leo Krupka, Deborah Petrie, Arnold Semeniuk, Dianne Skimming, Suzanne Stack, and Terry Willoughby for their ongoing dedication. Also thanks to our excellent team of judges and clerks for organizing and judging the stems. Start planning now for how you are going to grow that Best in Show stem or at least the visit the Show in 2017. We will look forward to seeing you there!